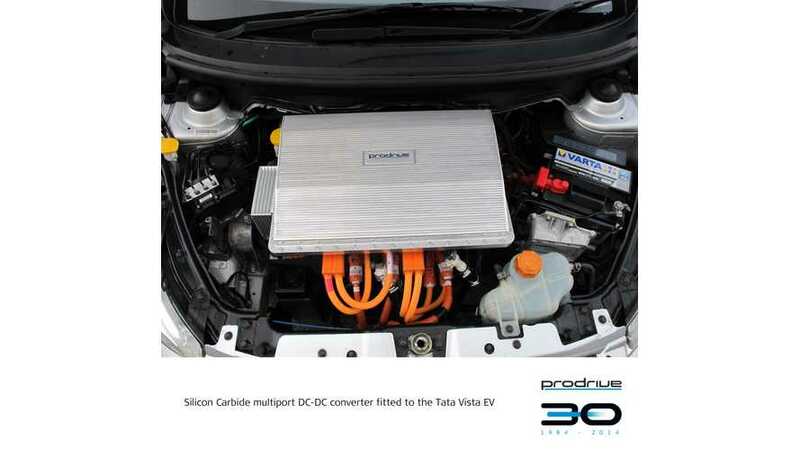 Prodrive, leader of a consortium of British companies including The University of Manchester, Tata Motors European Technical Centre, IST Power Products, Raytheon Systems and SCISYS, and backed by the Technology Strategy Board, announced an interesting milestone. The partners developed a Silicon Carbide multiport DC-DC converter for electric cars, which according to the press release has a class leading efficiency of 98.7% with gravimetric power density of 10.5kW/kg and a volumetric power density of 20kW/litre. Electric Tata Vista served as the test vehicle. "The DC-DC converter acts as a hub that transfers energy between key components of the vehicle’s high voltage electrical system. It has four ports: two connect to the traction motor and high voltage battery; a third connects to a secondary energy source, which in this test car is a super capacitor bank; and the fourth powers the vehicle’s 12V systems. The converter is able to match the voltages of these components and transfer energy between them in response to CAN commands from an external supervisory controller." "The test vehicle is a Tata Vista EV demonstrator vehicle, developed by the Tata Motors European Technical Centre in Warwick, which has a 220 V battery and 37 kW traction motor. The vehicle also has two 200 kJ super capacitor banks, which operate at 75-150 V."
A key aspect to achieve higher efficiency is the use of silicon carbide devices, which operates at much higher frequency than equivalent silicon components (75 kHz in this project) with a significant reduction in switching losses. The second gain is much higher temperature operation than conventional silicon modules. The second project in this area will lead to increasing the converter operating voltage to 750 V, further increasing power density and demonstrating operation at increased coolant temperatures.